I keep a gratitude journal (irregularly, but it’s there.) It’s a powerful tool for attitude adjustment, especially a few years ago when I had three surgeries in six months and was in constant, frightening pain. The journal really helped me see what my blessing were, even though, during that time, the lens I viewed them through had grown very small. I also have days where I wonder if the time and energy I put into my art and my writing have had any effect on the world. On those days, I console myself with the image of a pebble thrown into a great lake. We know we throw that pebble with our greatest intention. But we may never know how far the ripples travel, nor what shores they eventually fall upon. So those are my tips on how to get over the Eeyore thing. Yesterday was a perfect day for me. I finished up a new series of small framed pieces for a little art show at a friend’s coffee shop, Prime Roast, in Keene NH. 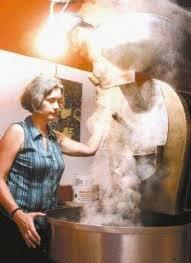 Judy Rogers roasting coffee at Prime Roast Coffee in Keene, NH. Photo from the Keene Sentinel. That’s my friend Judy in the photo. She hosts exhibitions for emerging and local artists, supporting our community artists. I’m thrilled with the new work, and I had a few compliments before I’d even finished hanging them. The icing on the cake was finding this reaction to articles I wrote recently. Is it bragging to share with you? I dunno. Well, yeah. But it’s not often we get to see the shore where the ripples gently fell. And when we do, it’s a blessing. So I am grateful to LaDonna today. Thank you, LaDonna! P.S. And just in case you think I take myself too seriously, here’s one of my favorite movie quotes, about what Conan the Barbarian thinks is good in life. I don’t think he keeps a gratitude journal, do you? Thank you, Luann. I don’t know what else to say. The issues you touch upon are ones each of us, as artists, have had to deal with. I especially enjoyed your thoughts about the purchasing of our art — or lack of purchases. I have struggled with the question of whether or not my art has value if no one buys it. It always brings me back to the question “Why do I make art?” , “Where does my art come from?”, and finally, “If I didn’t make art, what would I do instead?” And those questions lead me to believe that my making of art has nothing to do with making money, though it is always nice to make some money by selling my art. Rather, there is this voice inside me which wants to be heard, and my art is the way it speaks. Luann – you have no idea how positively your posts have affected me. As they have done for many many thousands of people all over the world. You certainly have cast a wide net. Thank you for your beautiful words and amazing thoughts. You truly inspire me. I also keep such a journal. It really does keep you thinking of the larger world in perspective. Keep it up! You might think you are tooting your own horn, but at times we need to. What is most important is that words that you had written touched the heart of someone desperately in need of comfort, hope, a feeling that they were not alone, and someone who obviously feels akin to that, reached out and was a hand to grab in their time of desperation and tragedy. The greatest steps we make, that are imprinted forever in my opinion, are the ones that we make which connect us through our humaness and spirituality to another who needs we what have to give and it does come vice versa. None of us knows what is for everyone and anyone and if a kind word can be given and gives comfort then you have succeeded. Thank you for being an avenue for her to ease her burden, we all have it within us, let’s all go do some good. And much good is done through art to be sure, go to a Seniors home with a picture of an old run down barn and listen to all the stories and see the emotions brought forth. I enjoy reading you articles well done. Luann – It is so nice to “hear” your amazing voice again by rediscovering your blog after many years. I was prompted to look you up when a friend gave me her copy of The Crafts Report and I read your essay on the back page – the same page my column used to be on! Then later I sat down and READ the column and had to talk to my friend again – to apologize for my snide comment because, yes it had EVERYTHING to do with art and was so beautifully written! You are so talented in both your art and the way you communicate. I’m so happy to see your column and rediscover your art.